I think it's essential to have a lip balm in the summer. One with spf is probably ideal, but any lip balm in general is good to keep your lips moisturised. I like this lip balm, well to be honest, I think all lip balms are good. But this does a good job and smells good too! I love the NYX Butter Glosses, they're really pigmented and they don't feel overly sticky. It's a great item to have when you just want something quick but pigmented. I love this colour with a tan, it's just the right orange for me. I have a swatch post of these here. 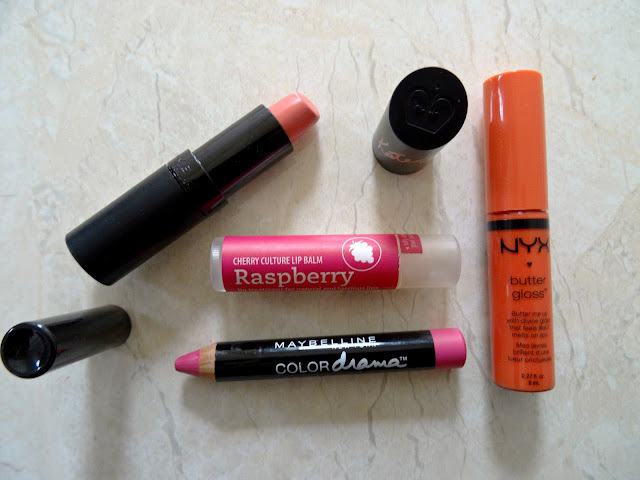 These are the latest lip products in my collection. I had seen a lot of people saying positive things about these but never thought to try them out. However, I finally got round to swatching them in Boots and boy do I love them! They're creamy yet are nice and pigmented. This colour is quite daring for me but I think Summer is the perfect time to give it a go. I think bright/bold lips look stunning with a minimal makeup look. If you try anything from this collection, it has to be this! Everyone knows that the Kate Moss lipsticks are stunning, there's such a big range of colours from nudes to bright purples! But if you're looking for a perfect Coral shade than this is the one for you! I sometimes find that corals don't suit me, but this colour is one that I feel most comfortable with. The texture is like most others in the range, it's just the right amount of creamy. If you want to see more about my holiday then click on this link here.